5 minutes on H/M trails, it feel/broke. Had to ratchet strap the rest of the day not to lose all I had. So came home $25 and a lower visit. I can see the pieces of aluminum you added. What I don't see is where it broke or what ever you meant by " feel/broke"? I also noticed you didn't drill the 3rd hole on each side, like PRM recommends you to do when hauling extra weight. You have to keep in mind this is a sport quad rack, not a utility rack. I think max weight is 20 lbs. I have yet to try mine out, but I did add the 3rd bolt on each side. And reinforced the deck with aluminum strips, where I bolted my cases down. I tried to buy that, but he didn't want to ship it. I don't know why he posted on a forum when trying to sale locally. It broke on the plastic and fell down. The bolts loosened on the frame. At the time I didn't notice the 3rd hole. I drilled it now and added lock nylon buts to each bolt. To me, If It can't carry 2 gallons of gas and a few lightweight tools, tire plug, why even have it? I'm not trying to carry a Yeti cooler packed with beer. I'm trying to have extra gas and supplies if needed on the trail. I haven't tried it yet, but will hopefully soon! What are you going to carry on yours? I had the six pack rack, that did fine, but only carried the tools I refer to above. I wanted extra gas, because we ride deep! It broke on the plastic and fell down. The bolts loosened on the frame. What are you going to carry on yours? I had the six pack rack, that did fine, but only carried the tools I refer to above. I wanted extra gas, because we ride deep! Are you talking about the fender supports? I'm not sure what you mean by plastic, my rack is all aluminum. I used the hardware provided and applied loctite as well. The PRM racks are thin & flimsy as far as side to side. The rear grab bar is strong as hell, if lifting straight up. If you try and jerk quad sideways like out of a rut, good luck! The rack does flex quit a bit, sideways with very little pressure applied. The repair you did, I don't see this helping any with side ways flex. And it looks like you used thinner material than the prm. I hope it holds up better for you on your next ride. As far as what I will be hauling, I have two storage boxes, one will be for drinks, and the other for tools. I will also carry a tow strap. 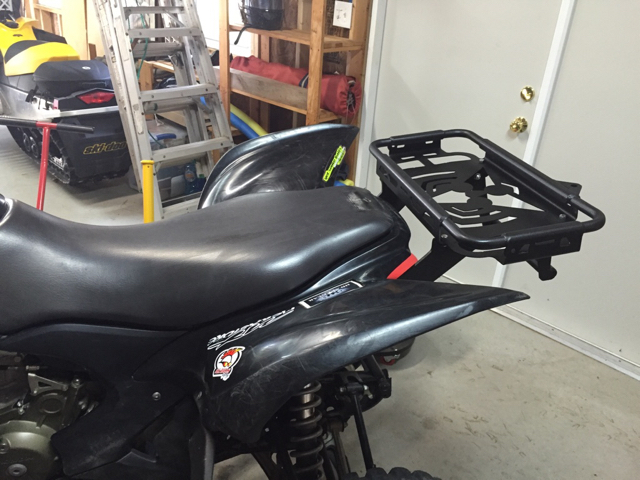 PRM says like 20 lbs max, but if I can lift the quad by the grab bar, why couldn't you add like 50 lbs? IDK but I don't plan on hauling much more than a couple drinks and tools, maybe a jacket. I will let you know how mine survives the hills of Wv. I have the same rack. I thought about adding support as well. Mine hasn't broke yet but I haven't put fuel on it. It's not strong enough. Are you referring to the thin deck or base of the rack? The 2 thin slivers of aluminum that hold it on the bike. It ways from side to side. I like the fix that supports it down to the frame between the rear A-Arms, adds some stiffness, but will need another bracket tying the two sides together. If you are wondering why mine is black, I used bed liner paint on it.